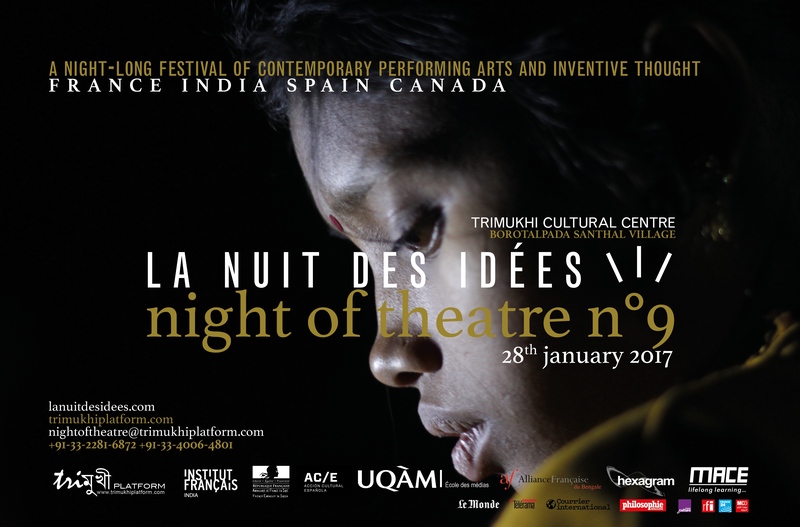 The Night of Theatre n°9 • La Nuit des idées, a night-long festival of contemporary performing arts and inventive thought, took place on Saturday 28th January 2017 at Trimukhi Cultural Centre in the Santhal tribal village of Borotalpada, West Bengal, India. Artists and scholars from Kolkata, Paris, Madrid and Montréal, together with Santhal actors, dancers and musicians both showcased in situ performances and evolved in stimulative conversations about art and thought. The night-long program ended with a joyful multicultural dance party. 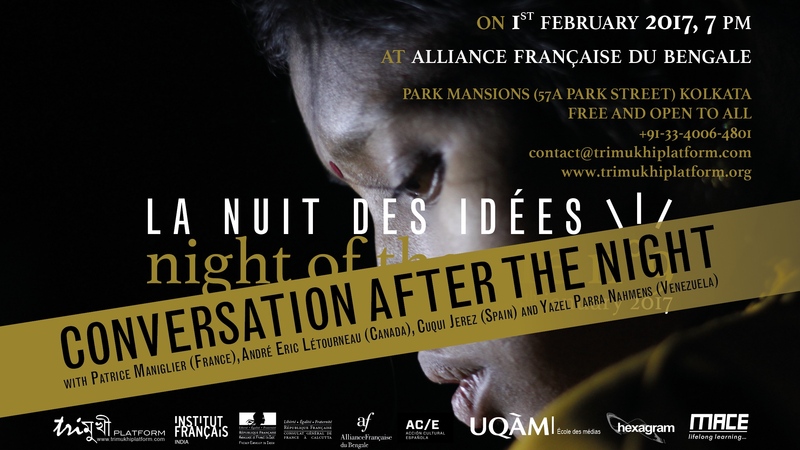 BEFORE THE NIGHT • PHILOSOPHICAL CAPSULES what is art? what is thought? Trimukhi Platform, Institut Français in India and Alliance Française du Bengale invited the theatre director Cuqui Jerez (Madrid, Berlin), the sound artist André-Éric Létourneau (Montréal), the philosopher Patrice Maniglier (Paris) and the performer Yazel Parra Nahmens (Caracas, Barcelona) to share their thought with Jean-Frédéric Chevallier after their experience in Borotalpada Santhal Village during Night of Theatre n°9 / La Nuit des Idées. To stimulate the production of thought, wine was offered by the General Consulate of France in Kolkata. On 16th March 2016, at Alliance Française du Bengale, Kolkata, Jean-Frédéric Chevallier (Trimukhi Platform) invited Suvojit Bagchi (The Hindu newspaper) and Samantak Das (Jadavpur University) to share their thought after their experience in Borotalpada village. This was part of a dry rehearsal for Night of Theatre n°9 that took place on 12th March 2016 at Trimukhi Cultural Centre in Borotalpada village. I didn’t expect what I found in Borotalpada Santhal village during Night of Theatre 9 • La Nuit des Idées. And surprise is the true sign of an experience. Trimukhi Platform is not simply a theatre company; it is the set up for a total experience. It constantly interrogate those who go through it about what they are actually attending to. On the one hand, what I saw in Borotalpada in January 2017 – more specifically the two parts performance Essay on Seasonal Variation in Santhal Society and Try Me Under Water – was very much like what I can see today in Paris best theatre places, like the Théâtre de la Ville in Paris or other national venues: it was contemporary theatre at its best, which means not the live adaptation of a text, but rather a kind of choreography of live audiovisual effects in a real space, using all the elements by which a scene can be produced today, video, sound, performances, voice, sing, lights, etc. What I saw in this small village of West Bengal sustains very well the comparison with performances staged by world famous directors like Castelucci, Marthaler, Pommerat, or Rodrigo Garcia. There were, however, a few differences. First, it was not staged in a theater room, but at the edge of a village. There is a stage, built by the company, in front of Trimukhi Cultural Centre, but the performance constantly overflows its supposed limits. At one time it appears on the side, and it goes behind the spectators, and then again we have to follow it down to the nearby lake where a screen waited for us in the water. It was impossible to distinguish, eventually, whether small events were or not part of the show. The entire night started playing for us, with us. But there another, more significant difference. Those young men and women who perform here are not professional actors. They are delegated by the villagers to give this performance. This performance is not aimed at an external audience: it is something people do for themselves. Therefore I wondered: is this theater? Is this theater in the sense I understand it when I’m in Paris. Is not Trimukhi Platform a very subtle machine aimed at producing misunderstandings. Misundersandings in the sense that of course we can all share this experience in its beauty and power. But the place for that experience in our world is not the same. This is not simply a show; it is life continued. And the way it is played confirmed this intuition. Performers don’t try to play at being anyone else; they are exactly what they give us to see. They are young Santhali villagers and true contemporary artists. They belong to (at least) two worlds at the same time, two worlds that precisely communicate at the moment of this performance. In the very confusion in which we all find ourselves at this moment, a common place is cleared. This common place is not the end of everything. It is only the beginning. Starting from this experience, the very question of our differences can now be raised. Those differences don’t preexist to this experience. They only exist as far as we are ready to go in the exploration of this savvy misunderstanding. What is at stake here is the very sense it makes to do theater – and even more generally to experience “art”. The problematic nature of this experience comes to the fore in the question whether we share exactly in the same experience, we, that is: the performers and me, but also the villagers who are here to attend to the performance and who contribute to it if only by welcoming me and the other invitees, but also the people from the nearby town who have come to attend to the show too as well as the spectators who came from Kolkata by bus. This unlikely “we” only exist because of the show. And each part of this “we” now has to redefine itself by the particular way it belongs to this we. No one comes back unaltered from Borotalpada. Trimukhi Platform is made for that: so that differences be not anymore given borders between already existing groups, but lines of fault that traverse each one of us. In a globalised world, Trimukhi represents an alternative to the standardized devastation of the world. Not because it vindicates the purity of each particularity; Trimukhi does not bother with authentic ethnicity and what it offers, as I have said, could very well exist in Avignon or Wuppertal. But it creates a common ground that is not preempted by one interpretation. For this reason we can say it is “global”. The global is not one and the same reality for everyone. The global is what we have to share and that in which we have to replay our differences. I think I have witnessed maybe for the first time in my life, in the small village of Borotalpada, in West Bengal, what global art of the future might look like.